about 15 years ago my parents gifted us with a scrawny twig of a plant. however, this twig did display beautiful shiny green/yellow leaves and scarlet flowers. my parents bought it for us as a decorative landscaping plant. dave planted it within view of our kitchen window where we can enjoy its seasonal changes and view the birds feasting on the split fruit, their little chins/beaks dripping with crimson juice. that “plant” is now a 25′ tree laden with pomegranates. more this year than ever (because of the heat) and since then we’ve planted three more “poms” which are all abundantly producing. i did a bit of research about the origin of the tree and discovered several facts about this ancient fruit. the pomegranate is believed to have originated in regions of iran and northern india, specifically the himalayas. it was introduced to latin america and california by the spanish in 1769. today it is widely cultivated in the southern mediterranean region of europe. it is a deciduous tree, typically 12-20′, with bright vermillion/scarlet flowers in the spring. it is self-pollinated AND cross-pollinated by insects. this could explain our abundance of fruit, as the burgeno-berman garden seems to be a haven for bees. very fortunate, indeed. the fruit is ripe when the tough outer skin has turned a deep pink-maroon hue. fortunately the healthy and vibrant fruit can endure a long storage and actually becomes juicier and more flavorful with age. the majestic fruit is crowned at the base by a “calyx” and contains distinctive segments filled with sweet/tart arils. the fruit is fat free, a good source of fiber, folate and VITAMINS C and K. some cultures believe the ancient pomegranate boasts medicinal powers, such as: inhibits fevers; treats heart/throat/mouth diseases; improves intellect and strength; is an aphrodisiac; quenches thirst; combats hot flashes; lowers cholesterol; checks cancer growth; and stops aging! wow…i suggest we stop using them as decorations in the autumn fruit bowl and start enjoying the juicy, ruby red fruits in every which way. here are a few ways we use them: atop salads, crowning yogurt/granola bowls, squeezed into juice, brightening up a grain dish or sautéed greens…or, one of our favorites, dropped into a glass of dry champagne or prosecco for an instant (and colorful) celebration of life. another interesting bit of information i learned: in greece, when someone buys a new home, it is conventional for a houseguest to bring a pomegranate as a first gift to be placed under/near the home “altar” as a symbol of abundance, fertility and good luck. little did i know i was blessing domenica’s new home in SLO when i brought up a large bag of pomegranates on move-in day. let’s hope they bring the new berman-jodar household good luck, abundance, beauty, continued good health (and fertility in about 15 years from now!). 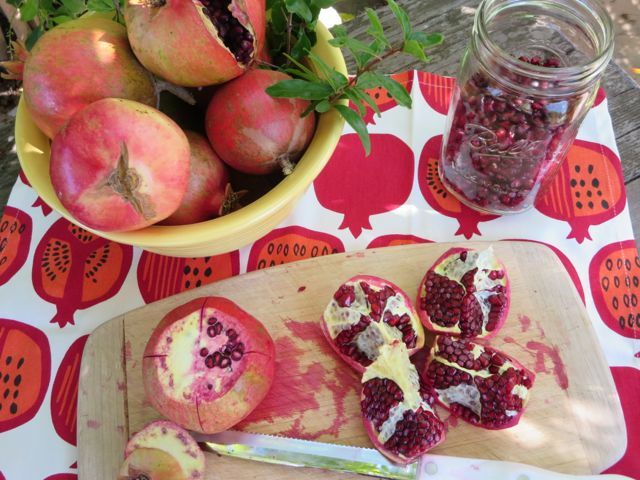 take care and come over to pick some pomegranates! This entry was posted in seasonal creations, Uncategorized and tagged ancient fruit, arils, easy method, medicinal, pomegranates by Elena. Bookmark the permalink.